Posted on 12/1/2009, 7:00 am, by rackycoo, under Handmade Gift Ideas. Happy December! The holiday season is upon us, and no matter which holiday you celebrate, you are bound to be in need of a few quick gift ideas that will delight your friends and family. Each day through this month, the Craftster blog will be spotlighting a different crafty gift that you can make. We’ve tried to keep them simple and inexpensive, yet thoughtful. Everyone loves a gift made with love. Hopefully one or more of the ideas we’ll present will spark your creative genius and help you choose the right gift for everyone on your list. Let’s get crafting! How about a nice stash-busting no-knit patchwork scarf? Choose the right fabrics, and you can make a scarf like this for anyone on your list, from the little kids, to teens, to grandpa! Thanks to stayfishtaylz for explaining how she made these great scarves. 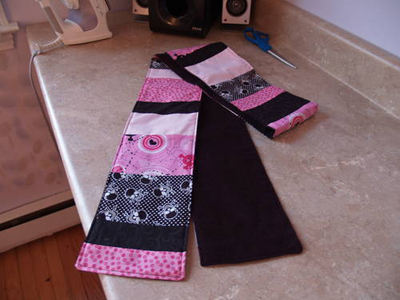 To visit Craftster and see how she made this and other scarves like it, click here. This are fabulous and easy to customize for all the friends and family members who want a new scarf this year! With so many fabric options, you can make them from scraps, fat quarters, fun fur, licensed prints, etc. Thanks for posting! MareMare made me one of these for a swap, and I adore it! I have gotten a lot of compliments on it. I also plan to make at least one for a Christmas gift.